כנור דוד / של שבע מינים, הנערכים ונארגים על מחלפות / הזמנים; מיני משונות, הגיונות ונגינות ;אשר כוננו / חושי על יתר, בשורותם יצירו, בשעת חילה, קינה ויללה; / יתרועעו אף ישירו, בהלולה, צהלה וגילה; ועוד בם כלולות, / שאלות ותשובות, איגרות וחידות; כפי תולדות הימים; / יחדיו ירננו, להרים קול במסא, כאשר ישחו בנות / שירי לקול הזמיר אשר ינועו ידי במתרי כלי שיר / דוד. Collection of poetry by David Franco Mendes, Amsterdam 1732-1775. Music and melodies, lamentations and wailing, responsa, letters and riddles, in chronological order. p. : Hebrew poem for David Franco Mendes by Joseph Shiprut de Gabay. p. : Hebrew poem for Yehiel Foa. p. 1: Letter of the author to Selichman Barent Solomon in Hamburg, 1771.
p. 2: Example of a Hebrew letter to a young man. p. 3: Hebrew nuptial poem for Jacob ben Israel Athias and Simhah, daughter of Elisha Pereira, 1732.
p. 4: Hebrew prayer, composed in 1733.
p. 5: Hebrew poem for Isaac Baruch Pardo, 1733.
p. 6: Idem for Joseph Shiprut de Gabay, 1737.
p. 7: Idem, composed in 1733.
p. 8: Nuptial poem for Josuah Hayim Sarphati and Esther, daughter of Samuel Cohen Faro, 1736, and printed Hebrew nuptial poem, 1734.
p. 9-12: Hebrew riddles for the wedding of Benjamin Dias Brandon. p. 13: Hebrew poem, composed in 1734.
p. 14: Hebrew poem for Josuah Hayim Sarphati, 1735.
p. 15, 16: Hebrew poems, composed in 1735.
p. 19-24: Halakhic responsum, 1735.
p. 25: Hebrew poem with alphabetic tricks. p. 26: Hebrew poems, composed in 1736.
p. 27, 28: Hebrew poems for Benjamin Dias Brandon. p. 29: Epitaph for Aaron Pereira Belmonte, 1736.
p. 30: Hebrew poem composed in 1737.
p. 31, 32: Prayer with ornament composed of Hebrew characters. p. 33: “Outava / 105 / Sacada do Livro Intitudado / Imperio de Dios en la Harmonia del Mundo / Composto p. D. L. B. [David Levi de Barrios] / Que traduzi em Lingoa Sacra por ser admiravel seu conseito”. With Hebrew translation. p. 34: Epitaph for Abraham Hayim da Fonseca, 1738.
p. 35: Example for a Hebrew letter. p. 36: Extract from the Lusiadas, by Luís Vaz de Camões, Chant 9, verse 56 “Mil Arvores estão ao Ceo subindo”. With Hebrew translation. p. 37: Hebrew poems composed in 1744.
p. 38: Letter to Moses Hayim Luzzatto, dated 22 Shevat 1744.
p. 39: Hebrew poems composed in 1747.
p. 40: Epitaphs for a couple Isaac and Rahel. p. 41: Caption in Dutch and Hebrew for a portrait of Isaac de Pinto and French Rondeau with Hebrew translation. p. 42: Epitaph in Portuguese: “O Epitafio / Asima, Compuz p.ª David Senior / de Coraçao / de q.m o Governador ouvia com / m.to gosto os Conselhos” . p. 43, 44: Hebrew poems composed in 1753.
p. 45: Epitaph for Aaron Hisqiau de Pinto, 1758, and Hebrew translations from the French [and Dutch]. Portuguese text: “S.ª do Bemaventurado & virtuoso / varão Aharon His: de Pinto: faleceo / de 47: @s em 3.sª fr.ª 22. Sebat 5518 / correspon.e com 31: Jan.ro 1758. S. A. G. D. G”. p. 46: Portuguese sonnet with Hebrew translation: “Eu vim hum dia Amor q[ue] se queixava”. 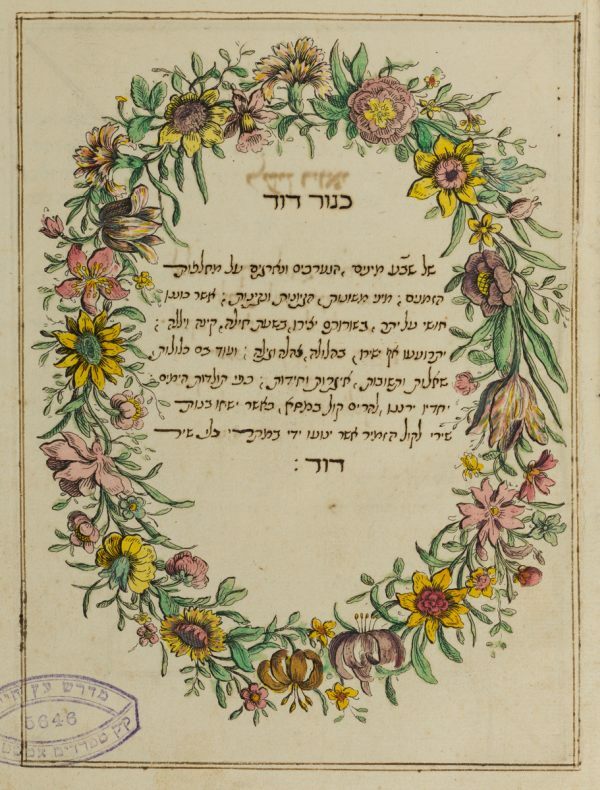 p. 47-51: Printed halakhic responsum. p. 52-58: Several Hebrew laudatory poems. p. 59: Epitaphs for members of the pious society Mikra kodesh. p. 60: Hebrew poems for members of the same society. p. 64: Printed Hebrew poem. p. 65: Hebrew poem for the pious society Mikra kodesh. p. 66, 67: Spanish and Hebrew poem by David Franco Mendes. Amsterdam, 11 Hesvan 5521 (21 October 1760). p. 68, 69: Rhymed fable. p. 70-73: Hebrew poems, composed in 1762.
p. 74, 75: Poems and captions in Dutch and Hebrew for Solomon Salem, 1763. p.76-88: Several laudatory poem, composed in 1764-1766.
p. 89-91: Dutch and Hebrew poems for William V of Orange, 1766.
p. 92: Portuguese and Hebrew poems, composed in 1766. Spanish and Italian short poems: “Aprended Flores de mí” and “Finché un Zeffiro soave”. p. 93, 94: 2 letters to Simhah Calimani, 1767.
p. 96: Hebrew letter to Hayim Palache, 1767.
p. 97-99: Poems composed in 1767.
p. 97: Spanish poem: “Es tan commun el pecar”. p. 107: Hebrew poem composed in 1768.
p. 108: Epitaph for Raphael Moses de Pinto Pereira, 1771.
p. 109, 110, 112, 113, 136, 137, 139, 140, 141: Hebrew letters to Naphtali Herz Wessely. p. 111: Nuptial poem for Solomon Machorro and Esther Machorro, 1771.
p. 114: 4 Epitaphs, 1772.
p. 115, 117, 121-127, 129, 135, 138, 142, 143, 146-160: Several Hebrew poems. p. 116, 145: Printed Hebrew poems. p. 127: Portuguese poems [Motete]: “Grande desgraça he o nacer”. French poem. p. 128: Letter to Hayim Modai. p. 130-132: Poems for the 100th anniversary of the Portuguese synagogue in Amsterdam, 1775.
p. 133: Abstract of a Portuguese astrological treatise with Hebrew translation. p. 134: Hebrew epitaph and French quatrain by Voltaire and Hebrew translation. p. 161: Dutch poem with Hebrew translation. For the author cf. EH 47 B 21, 22. Text in Hebrew with some parts in Portuguese, Spanish, Dutch and Italian and various annotations in Portuguese / Paper / 21,8 x 17,3 cm. /  + 161 pp. / Variety of lines to a page / Sephardic cirsive, square vocalised and current writing (autograph) / Title written in engraved frame, coloured by hand / Text illustrated with cut-out engravings, pasted upon the pages / 4 printed folia are bound with the text / Contemporary gold-tooled, leather binding with ‘David Franco Mendes’ stamped on the front and ‘Harp Davids’ on the back. Fuks 255. Kaplan 152. Fundação Calouste Gulbenkian.